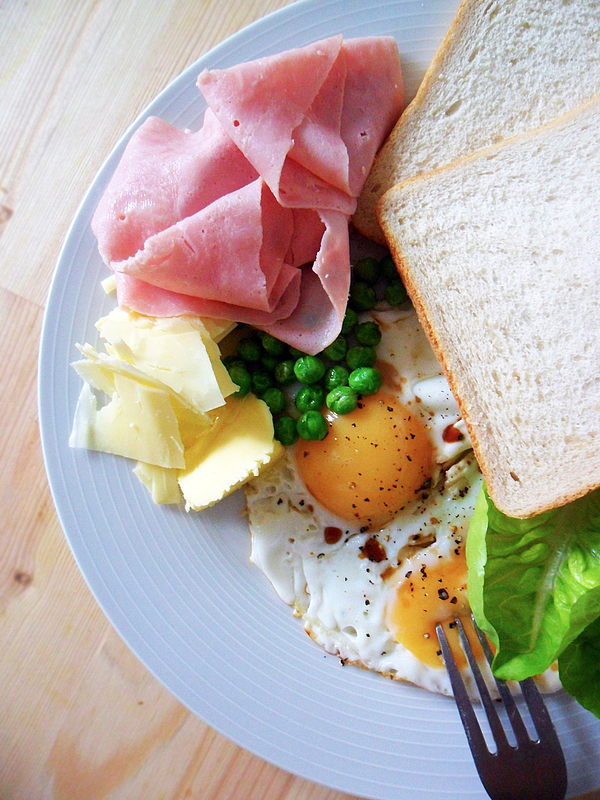 Sunday Breakfasts are a luxury, as much as sleeping-in is as well. But if you’re up bright and early on Sunday morning, sunny or not, put the kettle on and make a cuppa tea. But don’t stop there. Put a pan on, make an egg (or two) sunny-side-up. Toast some bread, and spread some butter. Why not toss in some cheese, some ham and peas even. Finally, don’t forget a bit of your 5-a-day: lettuce. Have a hearty breakfast, not only ‘cos it’s ‘the most important meal of the day’, but because you can afford the time to. Strangely enough, after coming back from Oslo, I found myself reminiscing Greece. 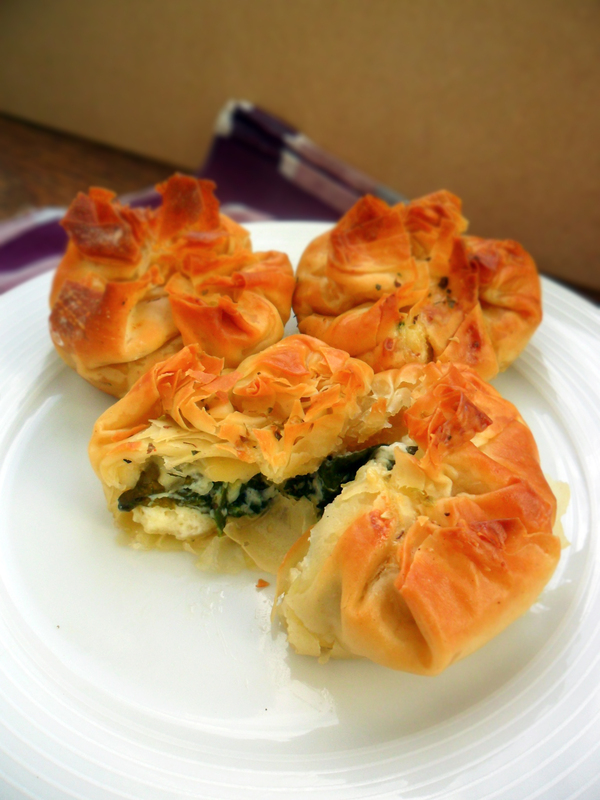 One of the things unique to Greek cuisine is the Spanakitiropita, or more commonly known as Spanakopita, which is a spinach and feta cheese pie. 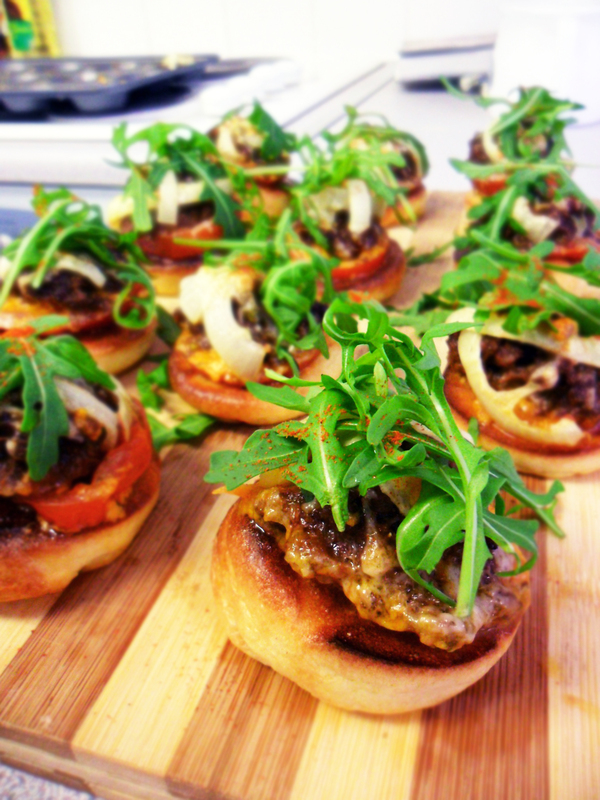 There are proper better recipes out there but here’s how I did mine, as little tarts. First things first, get everything ready. Preheat the oven to 200°C, boil about 2 pints of water, get a pot on the hob on low heat. Next, into the mixing bowl, crack the eggs and dump in the cheeses. Add the lemon zest and dried oregano as well. Pepper goes in as well. Stir about and stop before it’s all smooth. In this case, chunky is pretty good. When the water has boiled, empty the bag of spinach into the pot on the hob, then pour the boiling water in, just enough to wilt all the spinach leaves. Add a sprinkle of salt and toss about. The leaves should wilt in about 40 seconds or less. Once wilted, turn off the hob and drain the spinach leaves. Add them to the mixing bowl and mix everything about. 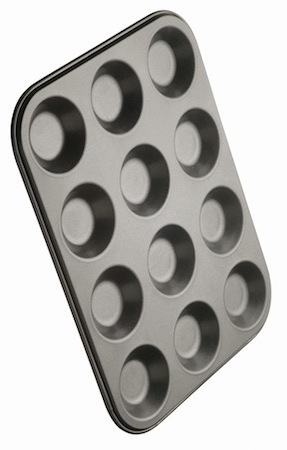 Get your muffin tray ready. Then, on a board, lay out a layer of filo pastry from the box. Half it lengthways and sideways so you get four individual pieces. Drizzle olive oil and pat each of them so they are coated evenly. Sprinkle paprika over the pieces. Layer each of them atop each other. Don’t worry if they’re broken here and there. Once done, lay it in a well of your muffin tray. Repeat for all 12 holes; you should only need 12 layers of filo pastry then. Fill the wells of filo with the spinach and cheese filling, or with spanakitiro. Pardon my urge to speak Greek. Wrap the little tarts up erratically. 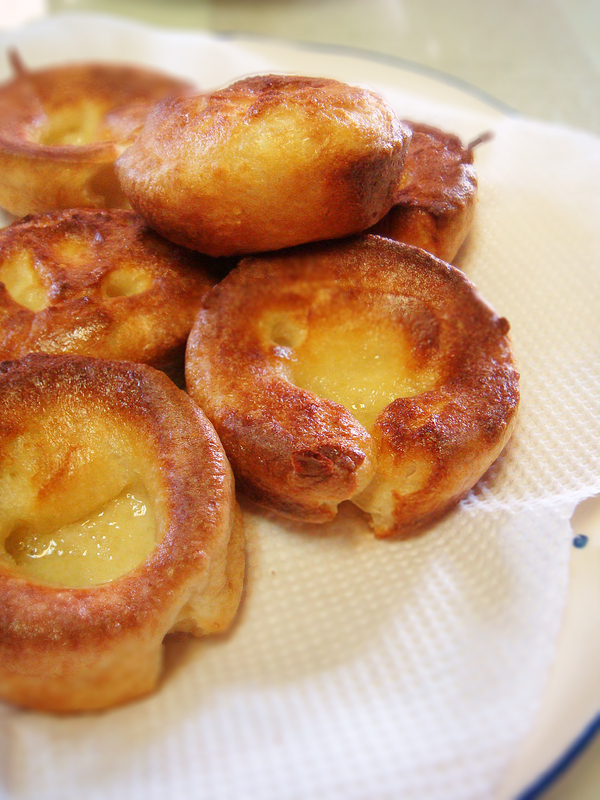 Pop them into the bottom rack of the oven. Welcome the Aroma Fairies into your kitchen. Take those babies out when they’re golden brown and let them rest for about 10 minutes or so, while you salivate. Wait some more if you want. If not, DIG IN. Dump whatever tickles your fancy into a tray, with the parboiled pasta dumplings. For this, I had a base layer of fresh wild rocket leaves, then a bunch of mushrooms and a couple of white onions, all sliced up. 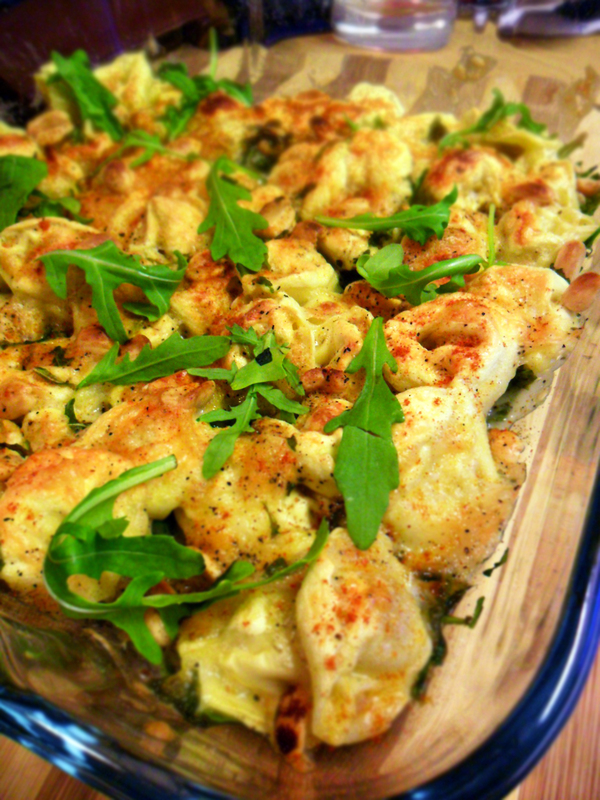 The tortellini of choice was bacon-filled, but if you’re vegetarian, spinach-filled ones works too! After adding the tortellini, I grated a hunk of cheese to cover the top, making sure every inch of that pasta goodness was sitting under a snug blanket of mature cheddar. Drizzled with nuts and chopped rocket, the tray goes into the oven, baked till golden and precious. Welcome the Aroma Fairies to your kitchen. Before devouring, more rocket is laid atop, together with a sprinkle of paprika for colour. Ignore the Very Succulent Braised Chicken Portions. What I’d like to turn your attention to, is the bland-looking mishmash of a pasta. Butter, mushrooms, garlic and oregano are a fantastic combination, a crowd-pleaser. But if what you wanna achieve out-of-this-world fireworks that will knock your loved ones out of their seats, add finely grated cheddar and chopped rocket before you take the pasta out of the pan. The nutty flavour of rocket will complement earthy oregano and mushrooms beautifully. The cheese sticks everything together, and adds the coveted stringy trail in every bite. 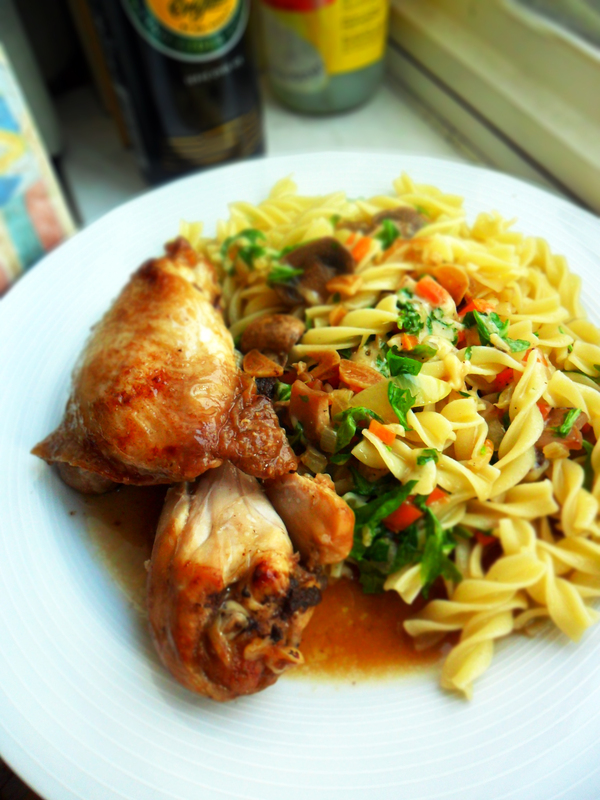 If you’re still looking at that juicy chicken thigh, I’m sorry the pasta doesn’t look as good. 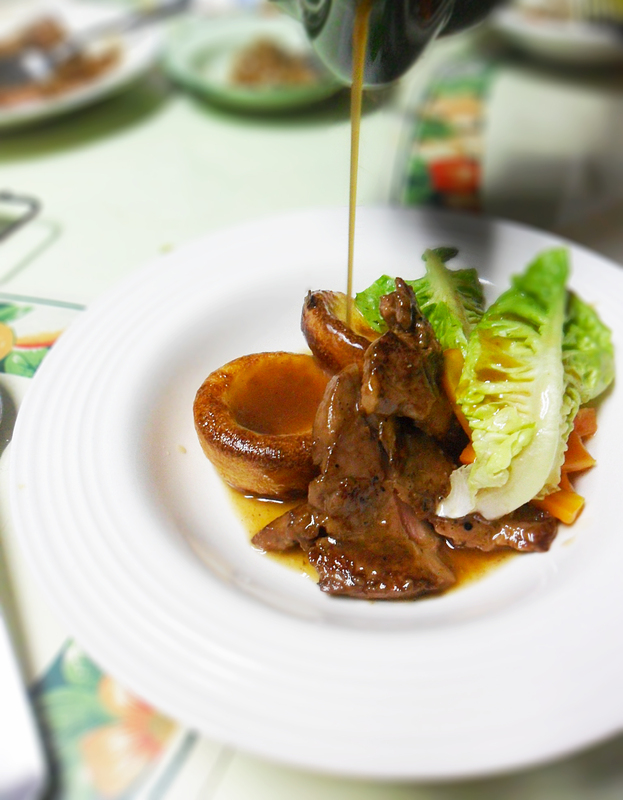 More on the Very Succulent Braised Chicken Portions here. Discovered a new way to eat pasta today. No, it doesn’t involve using bare hands to dig in. It’s actually a slightly different kinda sauce from the usual white sauce. Almost like carbonara but less rich and more tasty. I think. Here’s how to make, what I’d like to call, Cheesy Eggy Pasta. Fry the bacon to render out some of that glistening fat. Then, add a wad of butter together with the mushrooms and peas. 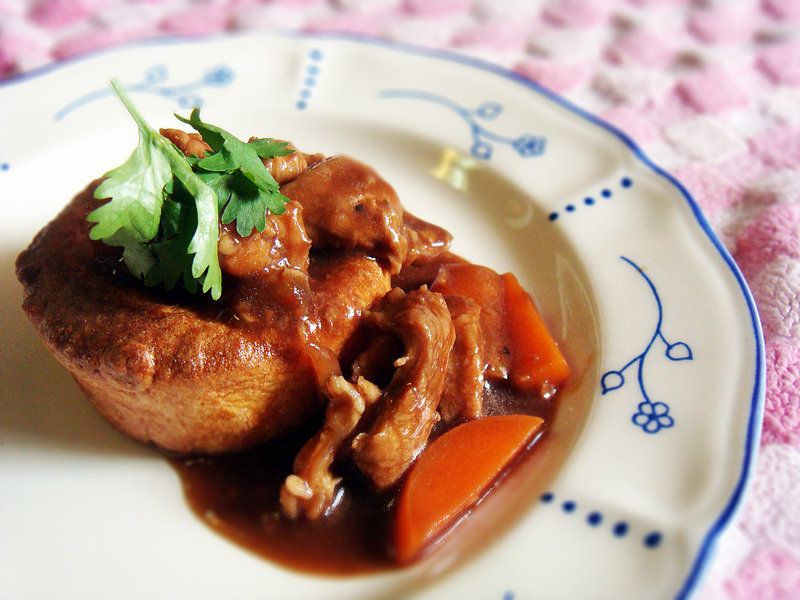 Don’t forget some oregano to complete the wholeness of flavour. Let the pasta join in the party when it’s done al dente. When you’re happy with the way everything looks in the pan, add milk. Just enough to make a sauce. And just before the milk boils, crack in an egg and grate in a hunk of cheese. Now, turn down the heat and mix. Don’t forget the salt and pepper. Parsley, optional. 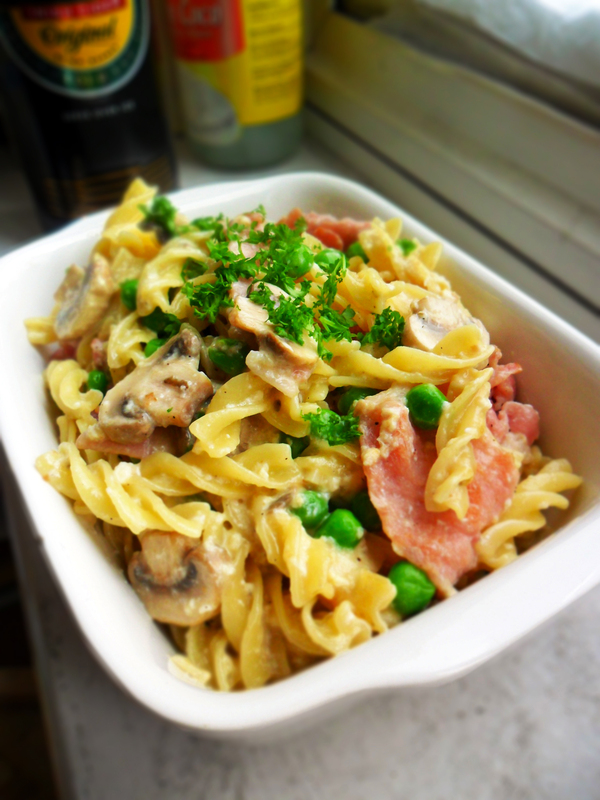 Finally, get ready to sink your teeth into a marvellous alliance of bacon, egg and cheese, all in your pasta sauce. It’s not midnight; I should be sleeping, but I got hungry. This photo really doesn’t do justice to the taste, especially after you have a bite of it in your mouth. It literally only took five minutes to make though. 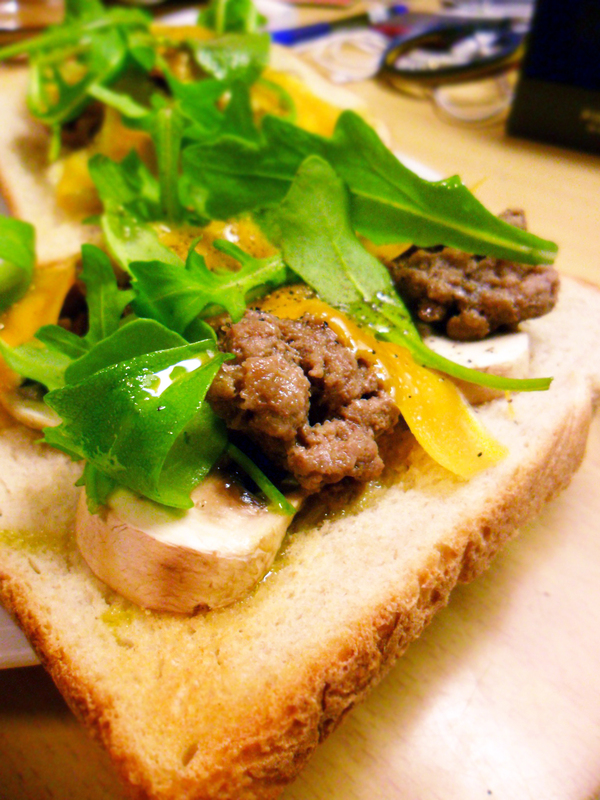 The explosion of garlic and pepper mixed with savoury cheese, and the pleasant hang of nutty rocket and olive oil, meaty mushrooms and earthy beef mince, sitting on crunchy crusty bread. Now I can sleep happy.